We are proud to offer asbestos removal services for homes and businesses that have recently flooded and have water damage. Many flood damage restoration companies stop when they find asbestos because they are not equipped or licensed to deal with it. Having to switch contractors could seriously impact the cost and time required to complete your flood cleanup and restoration. We are fully licensed, equipped and insured for removing all types of asbestos construction materials. During flood cleanup, there is often a large variety of water damaged building materials that must be removed. 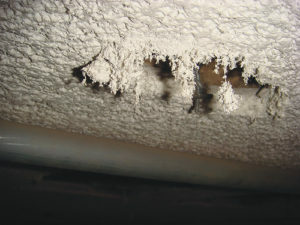 This material may contain asbestos, especially in older insulation, flooring, ceilings and walls. During the flood restoration process, everything in the room will be removed to avoid contamination. The walls will be covered with a protective lining to prevent any asbestos from sticking to them . This will prevent any asbestos from remaining in the room after we finish our cleanup process. A negative air pressure machine will also be in the room to create negative pressure and keep the asbestos under control. All of the harmful contents from your home will be double bagged and removed to prevent all asbestos-containing materials from escaping into the air. We will also thoroughly clean the room and equipment used in the asbestos removal and replace anything taken out of the room prior to the job. When we are finished with the process, we will contact a certified asbestos pickup company to pick up the removed asbestos and dispose of it in a manner that is safe for the environment. Call us now at (877) 645-1428 for our any asbestos removal services.